The federal Centers for Medicare and Medicaid Services (CMS) appear to discriminate against people with psychiatric illness. They will not approve the use of VNS (Vagus Nerve Stimulation) for treatment resistant depression among Medicare beneficiaries but have approved it for refractory epilepsy. 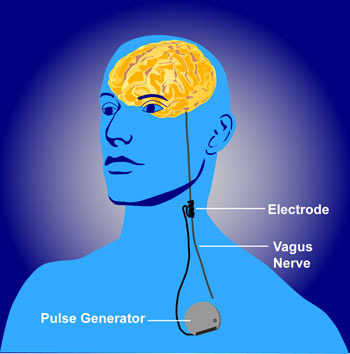 Vagus nerve stimulation consists of electrical stimulation of the vagus, one of the cranial nerves. The Federal Drug Administration (FDA) has already approved VNS for both illnesses, meaning that it has been judged to be effective and safe in both. The CMS decision will make it harder for poor patients to access this treatment because it means that Medicare will not reimburse the cost of the treatment. Cyberonics, the company that manufactures the device used to provide VNS, applied for CMS approval of the use of VNS for depression in 2007 and was rejected, but hoped that the research collected in the intervening years that shows VNS’s efficacy in treatment-resistant depression would be enough to get eventual approval from CMS. They have been rejected again. Editor’s Note: The data supporting VNS’s efficacy in epilepsy are skimpy and without a large effect size, so it cannot be argued that the quality of data supporting the coverage of VNS for depression is the reason it hasn’t been approved for that purpose. Both epilepsy and depression can be devastating and life altering. To support the use and reimbursement for the same FDA-approved device for one but not the other illness seems worthy of protest. This appears to be another example of the incongruous use of FDA approval status to deny coverage. Insurance companies and government agencies routinely use lack of FDA approval to deny reimbursement claims for many commonly used drugs and treatments, while at the same time, in cases such as the use of VNS, actual FDA approval is disregarded and considered an insufficient criterion. Having it both ways does not seem to bother the policy makers who appear to put the financial bottom line ahead of ethics, fairness, and good medical care.